Arrow reflects on the Oliver/Felicity relationship when they are stuck alone together in the Bunker after Chase sets off an EMP blast. Regular readers of this site will know that I’m not a fan of angst driven by romantic relationships. I don’t think that these types of stories are always terrible but the writers on all of the CW Superhero shows have demonstrated a lack of ability to write believable relationships that are worth investing in. I’ve mentioned in a few reviews of The Flash that most of the focus tends to be on the milestones rather than the day to day ups and downs. It’s all about heightening the drama by manufacturing angst in a lot of ways and it’s really tiresome to watch. Interestingly, the Oliver/Felicity relationship was well put together for a time. The first few episodes of season 4 had them functioning well as a couple as well as a team and it was great to see as it was two well developed characters involved in a relationship that felt real. Once the manufactured angst that led to their breakup crept in it became insufferable but for a while it was engaging and watchable. Unfortunately this episode focuses on the things that broke them up rather than the things that forced them together. It’s a shame as the format of this episode would have lent itself to some fascinating introspection that could perhaps have resolved those issues for good. A major issue on Team Arrow at the moment is that people are reluctant to talk about their problems. It has always been a problem to an extent and it comes from the top down. Oliver is a very guarded person who is unable to fully trust many people. It creates tension between him and others as well as a large amount of friction in his interactions. Oliver and Felicity’s interactions in this episode address how that relates specifically to them and giving them the opportunity to actually talk about what drove them apart is long overdue as there have always been distractions that allow them to avoid it. The discussion they have isn’t especially interesting but it is good that Felicity doesn’t accept Oliver’s excuse for not supporting her. He tells her that he noticed she was going down a dark path and didn’t want her to turn out like him. Whether Oliver truly believes that is the aim or not is up for debate but there is an element of his actions that comes down to mistrust. It comes back to the William problem from last season. Felicity mentions to Curtis in the flashbacks that Oliver hiding the truth about William is a symptom of a much larger problem between them. It boggles the mind that this thread would be resurrected after all this time. It was insufferable then and has only got worse with age. Suggesting that they had issues before this is a complete retcon as there was little to no friction in their relationship before this point. Not only that but I fully agree with Oliver’s decision around keeping William a secret from her as he was in an impossible situation with an ultimatum forced on him in order to be able to see his son. Attempting to add layers to the end of their relationship at this point doesn’t work and only serves as a reminder of how selfish Felicity behaved at that time. The handling of Oliver as a character in this episode is great. He has been working very hard to change his ways and become a better man which shows in abundance here. It first happens early on when Felicity accuses him of not trusting her which is then proven when he tries things his way and becomes injured as a result. It’s a lesson for him that he accepts and takes Felicity’s lead from then on. Basically Oliver’s feelings are largely dictated through his actions as he is focused on finding a way out of the situation and recognises that keeping Felicity on task could be the only way to do that. It isn’t until later in the episode that he decides to reflect on his feelings and the torture he faced at the hands of Chase is brought up. It’s clear that he is still missing a strong sense of self and barely holding it together. Granted it takes being near death for him to open up but the fact that he does let his feelings be known shows a lot of growth for the character. At this point he is truly trusting Felicity and she recognises it. The whole killing debate is brought up again. Despite Diggle’s reality check he is still convinced that his mission only began because he enjoys killing and it was the best way to enable his bloodlust. Felicity echoes Diggle’s sentiment which seems an obvious one but it’s something that Oliver needs to hear. After what Chase put him through anyone would have said whatever it was he wanted to hear and Oliver lasting a week is nothing short of astonishing. She points out that five years in hell as well as five years of dealing with the worst that humanity has to offer still hasn’t turned him into a monster which says everything about the kind of man he is. He may be a killer and may be convinced that killing is something he enjoys at this point but that just isn’t the man he is. There’s still a long way to go before Oliver believes it but everyone sees this in him and that will count for a lot. As shown in this episode his feelings tend to be defined by his actions so his tireless protection of the city and the people in it are a solid indicator of the reasons he puts on a costume and fights crime. Some work still needs to be done to explain why Oliver can’t bring himself to fully trust the team but that could be the part of his arc yet to come. Felicity gets some perspective on her own darkness and realises that her motivation for reawakening her Hacktivist tendencies and making morally questionable decisions was the death of Billy. I mentioned last week that her motivation for going down the darker path was flimsy and it still is but at least there is an attempt to explore it after the fact. In essence she experienced a small part of what Oliver has been through and it was enough to corrupt her. Unfortunately Billy’s death just isn’t a strong enough motivation because he barely fit the definition of a character. His relationship with Felicity wasn’t explored at all and next to nothing was known about him. A better use of the flashbacks in this episode might have been showing how they met and what drew them to each other. The flashbacks have completely moved away from the Russian setting at the moment. There weren’t any at all last week and this week they took place before this season began. It was cool to see Oliver in his season 4 costume and offer a story reason for him to have longer sleeves on his current costume but beyond that it was frustrating to tread old ground with Oliver and Felicity. Essentially the point of the flashbacks is to show that their feelings have never gone away and the attraction between them is as strong as it ever was. They both have a moment of weakness and give into it but what extra insight does this really give us about them? The short answer is none other than the fact that Felicity is keeping him at a distance because she feels that she can’t trust him and that he doesn’t really trust her. The point of their passionate experience shortly before the events of this season began was that they weren’t going to have it again which is fairly pointless when all is said and done. This is a relationship that should have been allowed to end and just fade into the background rather than constantly remind us that that they could reunite at some point. Outside of the bunker the rest of Team Arrow work to free Oliver and Felicity before they run out of air. It’s great to see them pull together without Oliver being around and it shows just how valuable these characters have become to the show. Oliver’s training has taught them a lot and they are really coming together as a cohesive unit. Curtis focusing on his tech skills in the field is the perfect area for him and there are plenty of opportunities to show that here. His dynamic with Rene is always fun to watch as well. 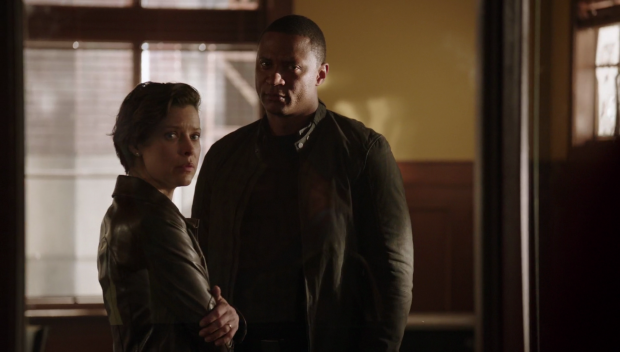 Diggle is still having issues with Lyla’s dishonesty and fractured morality since taking over A.R.G.U.S. This episode does something that the previous one didn’t by calling out Diggle’s objections as being completely hypocritical. Lyla directly challenges him on this by asking him what makes anything she does any different to what he does with Oliver. It allows her to win the argument as she objectively isn’t asking him to trust her on anything that he isn’t willingly doing for Oliver. There are still gaps in explaining exactly why Diggle doesn’t trust Lyla but I appreciate it being addressed directly. It allows them to draw a line in the sand at the very least so maybe this isn’t quite over. I’ve talked a lot about the interpersonal dynamics at play here but said little about the conceit of being trapped underground with a ticking clock as the main enemy. It works to a degree but also feels a little all over the place. It might have been more effective had the episode completely focused on Oliver and Felicity as knowing that Team Arrow were working to free them robbed the events of some of the urgency. 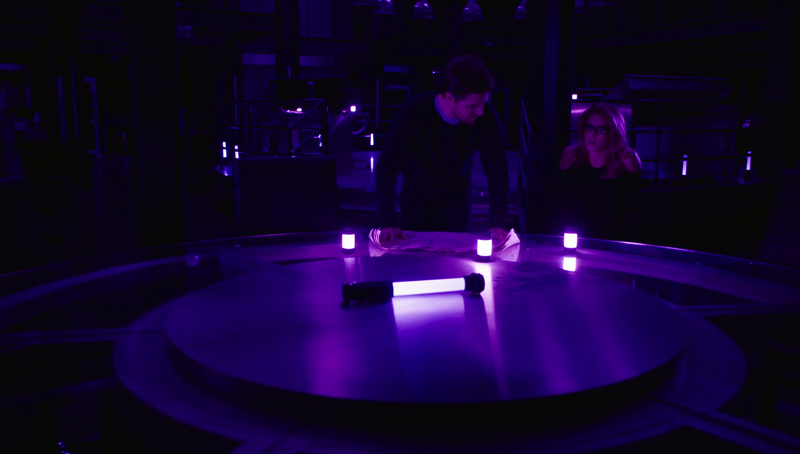 Oliver and Felicity having to use their wits to solve different problems as they appeared may have been a better way to handle it. The escalating threat does work well and the Team Arrow scenes are also good to watch but it doesn’t feel as urgent as the episode needed it to and the eventual resolution was very clunky. A solid if frustrating episode that suffers because it focuses on a relationship that should have been left in the past. Oliver and Felicity being stuck together only reawakens the frustrating angst that made their breakup so insufferable in the first place. The even attempts to add layers to the reasons for them breaking up that simply didn’t exist so it all could have been done without. I did find the exploration of Oliver’s reasons for not completely trusting people and Felicity telling him that he isn’t the monster he believes he is to be very strong. Felicity’s perspective on her own darkness what what motivated her down that path was at least an attempt to justify it even if it is flimsy. The flashbacks focusing on Oliver and Felicity shortly before the events of this season began are somewhat pointless as all it does is remind us that the feelings aren’t gone but there’s no chance of them reconnecting. The rest of Team Arrow working to free them also works well as it shows how cohesive they are as a unit and justifies the presence of all of the characters. Curtis using his tech skills in the field is great and his dynamic with Rene is always watchable. I really appreciated that Lyla calls Diggle out on his mistrust by pointing out that she isn’t asking him to trust her on anything he doesn’t routinely doing for Oliver. Showing Diggle as a hypocrite in this instance makes the most sense but there’s still no explanation for why that is. The handling of the scenario of Oliver and Felicity being trapped was mixed. Lots of it was exciting to watch but it might have been better if Team Arrow hadn’t been shown as there was a lack of tension or urgency in the scenario. The resolution was certainly very clunky.